Many years ago, in parts of Louisiana, Monday was not only wash day, it also included a lunch of steaming red beans and rice. The beans slow-cooked all day with smoky ham hocks or sausage along with the Louisiana trinity of onion, celery and bell pepper. Served with warm cornbread, red beans and rice often constituted the main meal of the day and quickly became a Southern favorite. The dish goes back well over two centuries. 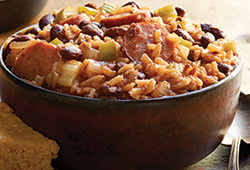 Today, Mahatma simplifies this tradition by combining long grain rice, quick-cooking red beans with a smokey ham flavor, enhanced with garlic, the Louisiana Trinity and Cajun herbs and spices which create a nice heat level. Just add your favorite sausage for a complete meal. Available in 8 oz. (227 g) package. Bring 3-1/4 cups of water (for saucier product, add an extra 1/4 cup water) and 1 tablespoon margarine (optional) to a boil in a medium saucepan. Stir in rice mix. Cover, reduce heat and simmer for 20 minutes. Remove from heat and let stand about 5 minutes. Stir before serving. 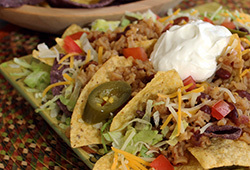 In a 3 quart microwave safe dish, combine 3-1/4 cups hot water (for saucier product, add an extra 1/4 cup water), 1 tablespoon margarine (optional), and rice mix. Cover and microwave on high for 20 minutes. Stir and let stand for 5 minutes. If your microwave does not have variable power settings, follow your manufacturer's directions. 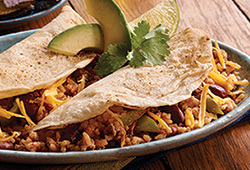 For a tasty variation of this rice mix --- slice one six-inch link of sausage into sections and brown in saucepan. Using the same saucepan, follow on the stove cooking directions. 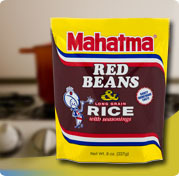 Need to prepare two Mahatma Red Beans and rice mixes at the same time? On the stove ... bring 6 ½ cups of water and 2 tablespoons margarine (optional) to a boil in a medium saucepan. Stir in two rice mixes. Cover, reduce heat and simmer for 20 minutes. Remove from heat and let stand about 5 minutes. Stir before serving. For the Microwave ... we do not recommend preparing more than one rice mix in the microwave at a time. 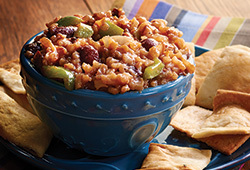 Do you have an electric pressure cooker, and want to cook our red beans and rice mix a bit faster? We used a MaxiMatic Brand Elite Platinum 6Qt Digital Pressure Cooker. 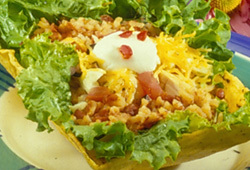 Prepare the red beans and rice mix with 3 ¼ cups water and 1 tablespoon butter. Set timer for 8 minutes then use the quick release pressure. 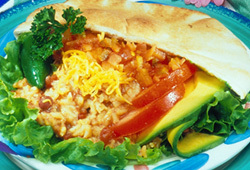 Enriched Long Grain Rice [Rice, Niacin, Iron (Ferric Orthophosphate), Thiamin (Thiamin Mononitrate), Folic Acid], Red Beans, Red Bean & Rice Seasoning [Salt, Garlic Powder, Yeast Extract, Dehydrated Onion, Maltodextrin, Chili Pepper, Spices, Partially Hydrogenated Soybean Oil, Natural and Artificial Flavor, Dried Beef Stock, Potassium Chloride, Rendered Bacon Fat, Natural Smoke Flavor, Disodium Inosinate, Disodium Guanylate, Onion Powder, Citric Acid).